The Galle district Disaster Management Committee members met in the district office of Southern Fisheries Organization Galle yesterday with 22 committee members. The members represented various field such as 10 youths from fisheries sector, 5 youths from farming sector, 3 volunteers, and 5 different youth members. 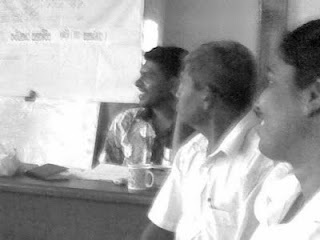 The main objectives are to conduct this committee meeting in each three months to discuss following key facts.
. Identifying places and the fields where disasters can be caused and to make people aware as soon as possible when it took place for moving them out of their lining places.
. To discuss a fast communication system to inform most vulnerable communities can be affected out of them. And conduct awareness programmes about future disasters to get ready to face them. “ In addition to these points specially we could talk their experience with the participants and they suggested to hold a theoretical training on 11th December 2009 as a future step and we could continue this programme for 5 hours today.” Said, Y- MESOC’s National coordinator with us.